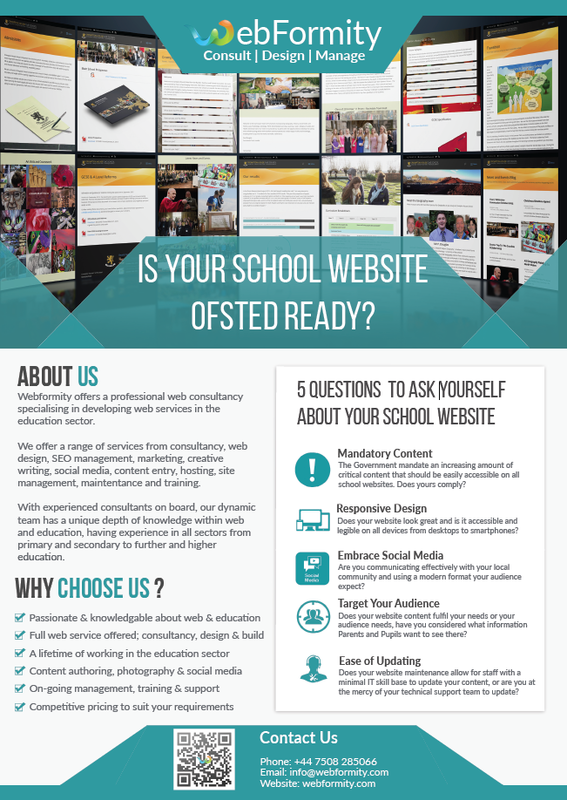 Webformity specialise in working with schools and are able to offer a unique and bespoke set of options to help bring your site up to inspection quality and beyond. Government legislation mandates some of the essential information that schools are required to have readily available and easily found on your school website. These obligations are growing each year with recent changes including an increase in the amount of information the school must display about the school governors for example. There are over twenty essential requirements in total – Do you know what they are and do you have them all in place? There is a further list of recommended information that schools should consider making available on their school site. Whilst this is only a recommendation we have it on good authority that Ofsted look to see if the suggestions have been taken on board. A significant part of Ofsted’s preparation for your inspection will be spent researching your school, combing through the school website, to establish how well you communicate with your community. The information they find or do not find on your website will inform their questioning during the inspection and ultimately their judgement of your school. We understand that schools are fast pace environments and know that school teaching and support staff are often far too busy to manage their web content in a timely manner, often relying on busy IT departments to manage update. – is this sounding familiar to you? We will provide full training to allow school staff to take on board site updates and maintenance or you can let Webformity handle them for you!